Details: WAFCOL Puppy Small & Medium For Small & Medium breed puppies aged 3 weeks to adult maturity Salmon & Potato - Hypoallergenic - Optimum Growth - Digestion Care - Immune System Health Wafcol Puppy Salmon & Potato is an outstanding food, which has been carefully formulated to meet all the nutritional requirements of small and medium breed puppies aged 3 weeks to adult maturity. Enriched with the Wafcol Ultimate Health Formula, Wafcol Puppy provides a highly palatable, nutritious and energy dense food formulated for optimum growth and development. The puppy's health and growth through to adulthood will largely depend on how well they are fed during their first year. A puppy will be growing and using nutrients and energy at a tremendous rate during the first months of their life. They will need approximately twice the amount of energy per unit of body weight as an adult dog of the same breed and so feeding the correct diet at this crucial stage is one of the most important steps an owner can take. 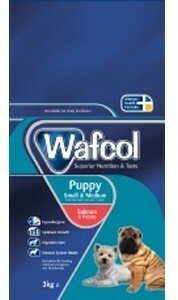 Wafcol Puppy is a hypoallergenic, Salmon & Potato food that is free from wheat gluten, maize, barley, rye, oats, red meat, poultry, dairy products, soya and all artificial colours and flavours. The symptoms of food allergies may vary, from diarrhoea to skin inflammation, and are caused when a food contains allergens such as wheat gluten is fed. By feeding a hypoallergenic Puppy food, your puppy will not be exposed to these allergens, there by lowering the risk of symptoms developing in later life. Wafcol Puppy food provides all the essential nutrients for this fundamental growth phase and gives your puppy the best start in life.